Operating in a dark, crowded space underground leaves little room for error. Learn how to maneuver and perform operations safely and efficiently with Cat® Simulators Underground Load Haul Dump System. Experience training exercises such as a Machine Walkaround, Controls Familiarization, System Tests, Bucket Placement, Driving, Truck Loading, and Dumping Into a Crusher. Plus, use a special Open Training mode to practice any technique or create a specific scenario. The system also includes training records management software to record and report each simulator session so operators, instructors and administrators can see the results. 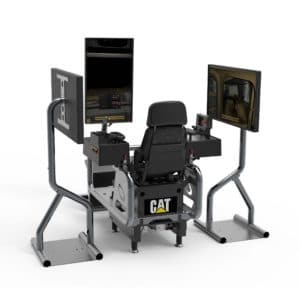 Hardware – Frame and controls needed to operate the simulator; computer, mouse, keyboard, seat, three monitor stands, three 43″ monitors and a motion system that allows users to feel vibration and movement when the simulated machine is running during training exercises. Software – Underground Load Haul Dump Simulator software and SimU Campus Training Records Management software. Languages supported in the software include English, French, Spanish, Portuguese, Russian and Chinese.